How does your Financial Advisor get paid? Is it right for you? Commission-Based: For years, the only way financial advisors could be compensated was to sell a product and receive a commission. As a result, advisors were often synonymous with stockbrokers, who were paid by the transaction. Commission-based advisors have been held to what is known as the suitability rule. This meant that as long as whatever they sold “suited” the objective of the client, then they met the requirements of the regulators. Pros: For folks who don’t do much trading, and hold nothing but a few stocks, these accounts are ideal. Since cost is solely based on trades, this would create a cost-efficient way to run the portfolio. Personalized advice may only be available for large accounts, but for investors requiring minimal advice and service, this may be fine. Cons: Advisors are paid on trading the account and aren’t legally obligated to act in your best interest, which can create pressure to trade or even situations that can sometimes act against the client (i.e., in extreme situations a “Wolf of Wall Street” scenario). There is little incentive on the advisor’s part to offer services beyond investment ideas and trade recommendations. Fee-Based Compensation: Fee-based simply means that the advisor can offer services for a fee (either a flat fee or an annual fee based on assets managed) and/or commission-based products such as retail mutual funds, annuities, or other insurance products. When working with fee-based advisors be sure to understand their background and whether their service is based primarily on planning and investment management fees or investment/insurance commissions, as well as their professional designations and experience. Pros: Your advisor has the ability to offer you fee-only planning, fee-based asset management, and/or commission-based insurance products or mutual funds. This provides more of an incentive for the advisor to not only know you and your needs, but to act in your best interest, as they have more flexibility in terms of how they are compensated. This makes it easier to work with just one advisor on both the insurance side and the planning/investment side. Cons: You must be aware of whether your advisor is acting as a fiduciary (which creates a legal requirement to act in the client’s best interest) in regards to your financial services. This higher standard applies to services generating fees, while the suitability rule still applies when selling commission-based products. This can create confusion for the consumer. 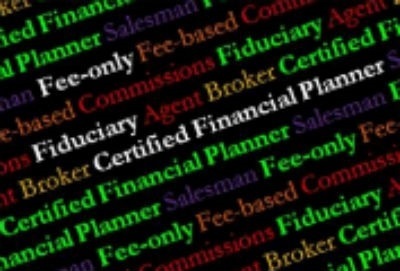 Look for a CFP® professional, as they are held to the higher fiduciary standard regardless of the services offered. Fee-Only Compensation: Fee-only means that the advisor is only receiving compensation via a fee structure that is usually either hourly, flat fee, or based on assets under management, all of which have their strengths & weaknesses. Hourly: Great for one-off projects. Generally clients who need help with only one or two specific issues might be able to use hourly fee services in a cost-effective fashion. Flat Fee: Usually based on income, net worth, or some other variables. Great for people who are looking to receive comprehensive financial guidance but who either don’t need professional investment management or have yet to accumulate enough assets to access services via an assets under management fee structure. This fee may be a one-time arrangement or an annual fee, depending on the advisor and the situation. Assets under management: The advisor is directly incentivized to grow your assets, as the advisor is compensated based on the value of the assets in your account(s). When there is a lot of trade activity it should not affect performance due to the absence of commissions. Hourly: The advisor is simply implementing a solution. The ability for him or her to help discover other issues isn’t a viable option in this structure since the hourly rate for comprehensive planning would certainly be higher than under the flat fee model. It is more difficult to know your cost in advance under this model, as the project may take longer than anticipated. Flat Fee: It is critical to outline the services to be provided for the fee, especially if it is an ongoing annual fee, and to establish a method for holding the advisor accountable to providing the promised service. Assets under management: Because the advisor’s fee is based purely on your investments under their management, they are not incentivized to focus on other areas of your financial plan and might not be as knowledgeable in other areas due to that fact. Also, if they aren’t able to charge on your assets held somewhere else (i.e., your 401(k)), they have no financial incentive to help you manage those assets. The degree of personal service received may depend on the size of your account relative to others managed by that advisor/firm. What’s happened over time is that many advisors have created hybrid models that can mix aspects of all of these compensation structures, in order to provide maximum flexibility for their clients. The key is to understand exactly how your advisor charges you and what the pros and cons are as it relates to that model. Understanding these service and compensation models is just as important as researching the advisor’s professional designations, experience and fiduciary status in making an informed decision. If you would like someone to help you explore what model is best for you or need help understanding how your current model is structured, please contact us at (904) 730-7433 to set up a complimentary consultation.